This is the illustrated story of my grand western motorcycle excursion in the glorious summer of 2004. My journey from Green Bay, WI, to Glacier National Park, MT, followed Federal highways. I discovered that these routes used to have names, that they were at one time aligned with the railroads, and that the railroads of course ran along rivers. Driving the interstates nowadays, you may arrive at the notion that the roads are wholly new. They are not. They come out of the places we have always been and go to the places we have always wanted to be by trails that were old, time out of mind. I traveled 3500 mi and bought nearly 100 gal of fuel at an average cost of $1.98/gal. 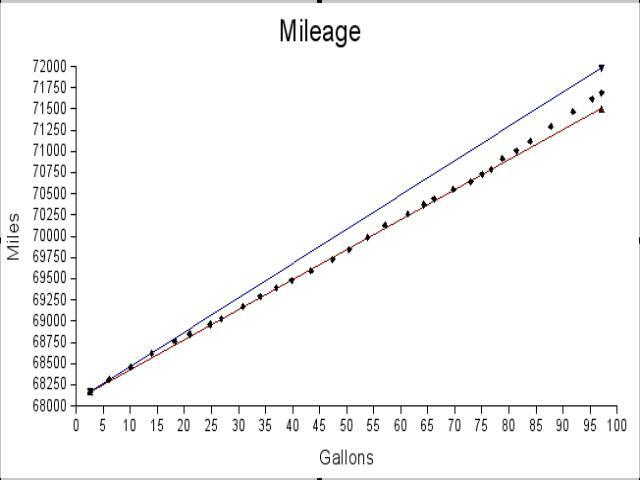 Mean fuel economy was 37.3 mi/gal overall and ranged between 35 mi/gal (the red line in the graph) and 40 mi/gal (the blue line). I obtained better mileage in the east where speed limits were lower. Rhode, Chuck. "The Hi-Line and the Yellowstone Trail." The Hi-Line and the Yellowstone Trail: To Glacier Park and Back Again. 1 Sept. 2004. Lacus Veris. 24 Apr. 2019 <http://lacusveris.com/The Hi-Line and the Yellowstone Trail/index.shtml>. Last modified 6 Oct. 2015. Served 15845 times between 16 May. 2010 and 24 Apr. 2019. Contact mailto:CRhode@LacusVeris.com?subject=LacusVeris.